My lawn is no longer sustainable in its current form. Not because its not beautiful or healthy with the additional water. Its just that. water. Denver is not considering the concrete jungle its creating. Density is thirsty. Its replacement must be maintenance sustainable. The ease of lawn mowing is overstated. Unless you move to a completely static xeriscape, a great example is below. The maintenance is that of any perennial beds. Grass shearing late spring. Mulch renewal early summer. Fall and winter is rest. Despite the timeless feel to many natural environments, they are all in a state of constant change and flux. … there is no balance of nature, but only a constant ebb and flow of species. Ebb is the suburban grass of old, new is the plants to invite nature to dine and set their roots for future generations. Dropseed or Sporobolis herterolepsis is a Colorado native grass. 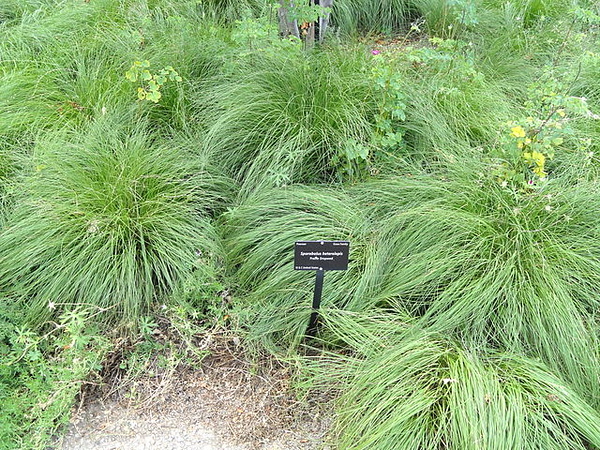 Fine-textured and hair-like with medium green leaves. Mounded shape from 20″ long leaves of arching habit. Fall color is golden to orange and bronze in winter. 20″H x 15″x 18″ wide. I am starting with 13 plants to cover an area of 100sq ft or a section 10′ x 10′. Behind shots of onion in spring, more information for Sporobolis heterolepis. black swallowtails host plants are of the parsley family. Upright evergreen on the left to balance the visual weight on the left axis of main view. The blue arrow Juniper is the first on the list. Its purportions are right at 12h x 4w but it wants full sun. With the removal of both the ash and silver maple, this may be just right. need to convert to wiki! Kinnikinnick Bearberry . (Arctostaphylos uva-ursi) Low, prostrate whose leaves resemble boxwood from afar, but up close check out these leaves! It also is a host plant to the Hoary Elfin, Brown Elfin and Freija Fritillary – see if those are on the Jefferson County list. A native in Colorado. Needs acidic soil 4 -6 (under pine?) – but sure looks lovely in the sun. Bearberry is a contender for the Emerald Isles groundcover. That is what I will name the patch where Eryl will sit and watch its tiny sea. That or geranium. It may also depend on the height need to establish the visual balance. Obstructing some of the view of the rock wall will help there as well. Design needs to consider establishing a symmetry across the back yard. A balance from left to right. a rhythm, a flow. Attracting Wildlife, Attracts butterflies, Back Yard, Native cornus, cosmos, dropseed, evergreens, go native, mexican feather, pollinator, prarie. permalink.